In today’s time, movies and series are a main source of divertissement where after having spent a long day at work, kicking the shoes in front of a good movie can be relaxing. Not everyone has the chance to do that every other night and we are talking about those children who are seriously and even terminally ill.
To bring support to the children that don’t have the opportunity to lead a normal life, Lucky Pants Bingo has teamed up with the Starlight Children Foundation. And to be able to carry out the mission to make those children’s dreams come true, your help would be most appreciated The Starlight Children Foundation has been around since 1986 and has been bringing their support to all children across England, Scotland, Wales, Northern Ireland, the Channel Islands and the Isle of Man. Many ways have been employed so as to light up the faces of those little angels and this includes delivering services into every child’s ward in hospitals and hospices. Knowing that the children’s family as well are going through hard times, Starlight has gone the extra length to bring supports to every child’s family by lifting the children’s spirits and also by making their dreams come true. Starlight Children Foundation first emerged when actress Emma Samms, who at a very young age lost her younger brother who battled against an incurable disease and finally lost his life. Some years later, Emma visited a little boy, who was seriously ill and after becoming friends, the little boy confided in her that his dream was to visit Disneyland. Only then Emma got the idea of fundraising so as to make his dream come true. After seeing the pure joy and happiness on the little boy’s face as well as his mother, Emma got the idea of starting the Starlight Children’s Foundation that supports the children regardless to the illness they have. This gesture is being carried out so as the children respond better to the treatments that is being carried out thus why we need your support to brighten up many lives in their difficult times. Every little help counts towards this goal. 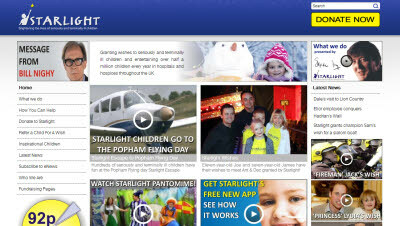 Lucky Pants Bingo, a UK based online bingo site has teamed up with Starlight Children’s Foundation to raise money. Lucky Pants Bingo has already taken the step towards bringing some joy into the lives of those children and if you as well would like to help those children then join hands with Lucky Pants Bingo and start making a difference into the lives of innocent children who are only awaiting for their dreams to be fulfilled. Throughout many ways, Lucky Pants Bingo has taken up for mission to raise the maximum money to make a difference into those children’s lives. The devised methods through which the online bingo site is going to raise money are the text to donate, office collection, spin for charity and the big Prebuy 90 Ball bingo game where the online bingo site will match the pot to donate to Starlight. If every person would donate a little something, many children would be happy despite suffering from an illness or terminally ill. Let’s do this together since every child deserve a little bit of happiness in their lives.